Receive solid volleyball instruction and have fun competing in exciting matches. Open to both teams and individuals. Registration is open to campers from 14 to 18 years old who have just completed or are entering into grades 9–12. Improving your volleyball skills during the off-season is a great way to gain a leading edge on the volleyball court. For new and experienced players, Youth Outreach Ministry Volleyball Camp provides thorough training in an uplifting Christian environment. Led by the Pensacola Christian College Lady Eagles coaching staff, this volleyball camp emphasizes personal skill development and Christian sportsmanship to apply now and throughout your future volleyball endeavors. Daily exercises and training include passing, setting, blocking, spiking, and serving, with skills put to the test in daily scrimmage games. Registration closes Wednesday, July 18, at 8 a.m. Registration closes Wednesday, July 25, at 8 a.m.
Special attention is given to both beginners and more advanced players, so each camper can develop abilities and compete at her best level. Three-on-three tournaments and skill competitions will challenge you to do your best while striving for a spot on the camp All-Star teams. Awards are presented to individual competition winners and championship winners. Learn volleyball skills with instruction geared to players on all levels. Improve those skills with one-on-one instruction and individual skills competitions. Apply individual skills on the court while learning how to be a team player. Compete in and earn awards for three-on-three tournaments and team matches. The PCC Sports Center arena, where Volleyball Camp is held, is home to the Lady Eagles intercollegiate volleyball team and features three regulation-size courts. For every six campers that a school sends to our sports camps, one coach from that school may attend the camp for only the $60 Registration Fee and will stay with the campers (additional coaches pay coach fee). A coach must accompany each team attending Volleyball Camp. Coach Calyn Ohman graduated from Pensacola Christian College in 2006 with a bachelor’s degree in physical education. After coaching at Pensacola Christian Academy for seven years, she began coaching the PCC Lady Eagles volleyball team in 2017. 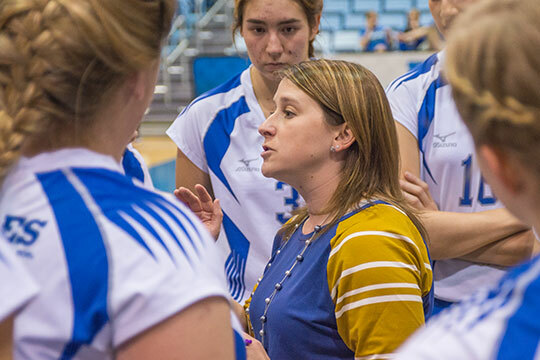 Coach Ohman’s desire for Volleyball Camp is for student-athletes not only to sharpen and learn volleyball skills and to grow the love of the game but also to learn practical life lessons and to apply them to their Christian walk with the Lord.